A buffer that holds initialization data and coded frames that will be decoded and rendered. 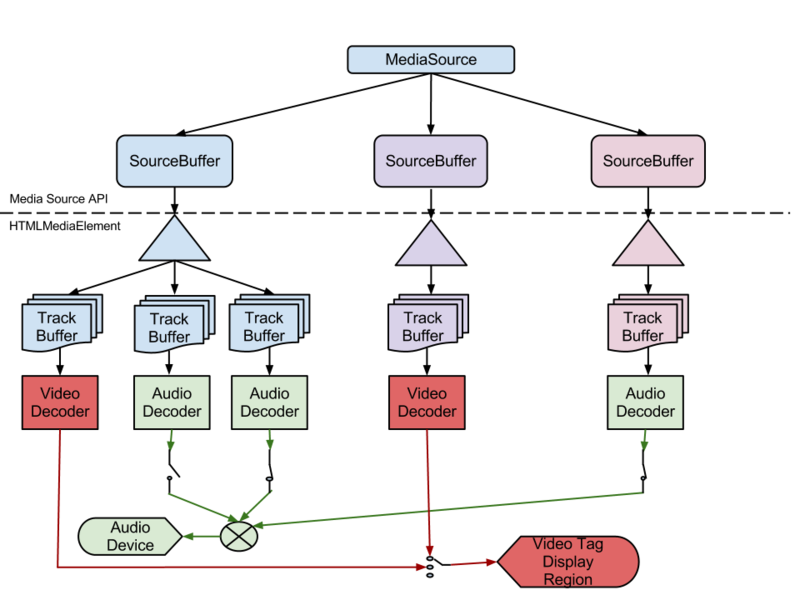 This buffer may not exist in actual implementations, but it is intended to represent media data that will be decoded no matter what media segments are appended to update the SourceBuffer. This distinction is important when considering appends that happen close to the current playback position. See Track Buffer to Decoder Buffer transfer for details. The subsections below outline the buffering model for this specification. It describes the various rules and behaviors associated with appending data to an individual SourceBuffer. At the highest level, the web application creates SourceBuffer objects and appends sequences of initialization segments and media segments to update their state. The media element pulls media data out of the MediaSource object, plays it, and fires events just like it would if a normal URL was passed to the src attribute. The web application is expected to monitor media element events to determine when it needs to append more media segments. There are several ways that media segments can overlap segments in the SourceBuffer. Behavior for the different overlap situations are described below. If more than one overlap applies, then the start overlap must be resolved first, followed by any complete overlaps, and finally the end overlap. If a segment contains multiple tracks then the overlap is resolved independently for each track. The figure above shows how the SourceBuffer is updated when a new media segment completely overlaps a segment in the buffer. In this case, the new segment completely replaces the old segment. The figure above shows how the SourceBuffer is updated when the beginning of a new media segment overlaps a segment in the buffer. In this case, the new segment replaces all the old media data in the overlapping region. Since media segments are constrained to starting with random access points, this provides a seamless transition between segments. When an audio frame in the SourceBuffer overlaps with the start of the new media segment special behavior is required. At a minimum implementations must support dropping the old audio frame that overlaps the start of the new segment and insert silence for the small gap that is created. Higher quality implementations may support crossfading or crosslapping between the overlapping audio frames. No matter which strategy is implemented, no gaps are created in the ranges reported by buffered and playback must never stall at the overlap. The figure above shows how the SourceBuffer is updated when the end of a new media segment overlaps the beginning of a segment in the buffer. In this case, the SourceBuffer tries to keep as much of the old segment as possible. The amount saved depends on where the closest random access point, in the old segment, is to the end of the new segment. In the case of audio, if the gap is smaller than the size of an audio frame, then the SourceBuffer may render silence for this gap. This gap must not be reflect in buffered. The entire new segment must be added to the SourceBuffer, but it is up to the implementation to determine how much of the old segment data is retained. An implementation may keep old segment data before the end of the new segment to avoid creating a gap if it wishes. Doing this though can significantly increase implementation complexity and could cause delays at the splice point. The web application can use buffered to determine how much of the old segment was preserved. The figure above shows how the SourceBuffer is updated when the new media segment is in the middle of the old segment. This condition is handled by first resolving the start overlap and then resolving the end overlap. The track buffer represents the media that the web application would like the media element to play. The decoder buffer contains the data that will actually get decoded and rendered. In most cases the decoder buffer will simply contain a subset of the track buffer near the current playback position. These two buffers start to diverge when media segments that overlap or are very close to the current playback position are appended. Depending on the contents of the new media segment it may not be possible to switch to the new data immediately because there isn't a random access point close enough to the current playback position. The quality of the implementation determines how much data is considered "in the decoder buffer." It should transfer data to the decoder buffer as late as possible whilst maintaining seamless playback. Some implementations may be able to instantiate multiple decoders or decode the new data significantly faster than real-time to achieve a seamless splice immediately. Other implementations may delay until the next random access point before switching to the newly appended data. Notice that this difference in behavior is only observable when appending close to the current playback position. The decoder buffer represents a media subsegment, like a group of pictures or something with similar decode dependencies, that the media element commits to playing. This commitment may be influenced by a variety of things like limited decoding resources, hardware decode buffers, a jitter buffer, or the desire to limit implementation complexity. Here is an example to help clarify the role of the decoder buffer. Say the current playback position has a timestamp of 8 and the media element pulled frames with timestamp 9 & 10 into the decoder buffer. The web application then appends a higher quality media segment that starts with a random access point at timestamp 9. The track buffer will get updated with the higher quality data, but the media element won't be able to switch to this higher quality data until the next random access point at timestamp 20. This is because a frame for timestamp 9 is already in the decoder buffer. The decoder buffer represents the "point of no return." for decoding. If a seek occurs the media element may choose to use the higher quality data since a seek might imply flushing the decoder buffer and the user expects a break in playback. Remove all the tracks in sourceBuffer.audioTracks, sourceBuffer.videoTracks, and sourceBuffer.textTracks and queue a task to fire a simple event named change at the modified lists. Queue a task to fire a simple event named change at the HTMLMediaElement track lists that were modified. updateend Event updating transitions from true to false. error Event An error occurred during the append. abort Event The append or remove was aborted by an abort() call. Need more data: If the stream append loop algorithm is running and still has data to read, then abort these steps. If last decode timestamp for track buffer is set and decode timestamp is less than last decode timestamp, then call endOfStream("decode") and abort these steps. Add the coded frame with the presentation timestamp and decode timestamp, to the track buffer. Each PES packet must be comprised of one or more complete access units.